Ahead of the Conservative Party Conference in Birmingham, thousands of ordinary workers marched to call time on failed austerity and instead to campaign for a new deal for working people. We need a minimum wage of £10 an hour, now. Ban those exploitative zero hours contracts. Fund our NHS and public services properly. Repeal the trade union act which makes it harder for us to stand up for working people. Crack down on tax dodgers who starve our schools and hospitals of funding. Together – we can build a growing economy for the many not the few. Together – we can nurture a society free from sexism, racism and discrimination. And together – we can win the New Deal working people are crying out for. 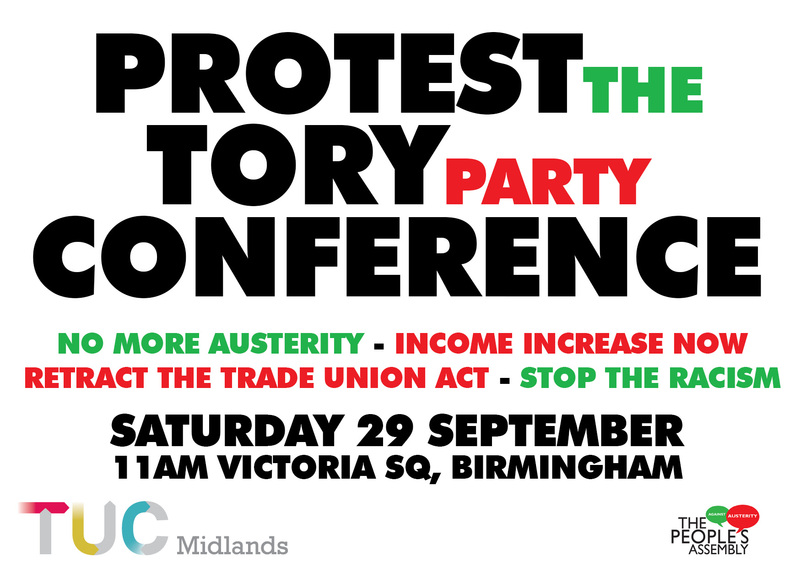 Ten volunteers from Wolves TUC & Peoples Assembly leafleted for this demo at Wolverhampton train station from 7.30am on Thursday 27th September.